A new City campaign aims to persuade higher levels of government to fund social-housing repairs. 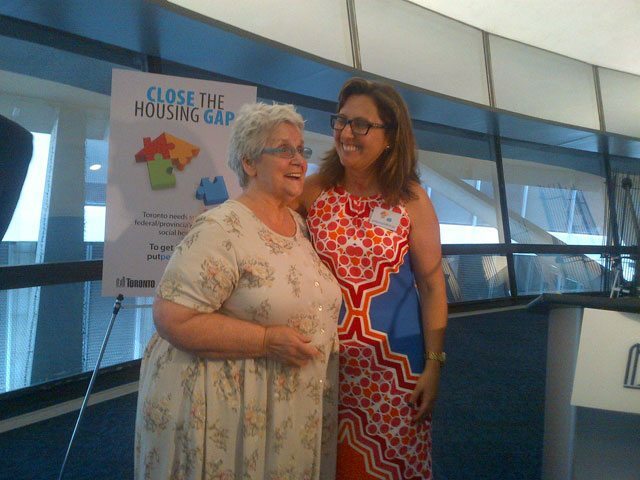 Councillor Ana Bailão poses with Doris Power at the launch of “Closing the Housing Gap” on June 24. The City currently receives federal funding for social housing, to the tune of $161 million in 2012, but this amount is set to decrease in coming years. According to the City’s affordable housing spokesperson, Gil Hardy, the federal government downloaded the responsibility for TCHC mortgages to the province, who in turn passed the responsibility on to the City. Once those mortgages are paid off in 2031, the federal funding will expire, leaving the City on the hook for all social-housing upkeep costs. A little extra money comes from the province, which subsidizes affordable housing for Ontario tenants on social assistance, but the payouts are significantly less for social-housing tenants, as opposed to private-market renters. The City currently pays the difference, at a cost of about $81 million per year. A recently announced $150 million reduction in provincial funding for the City could force Torontonians to foot even more of the bill. Bailão says this is an issue for all Torontonians, whose service-delivery costs and property taxes increase when residents lack proper housing. “Every Torontonian knows that it’s cheaper to house people properly, instead of having them in hospitals, in shelters, or in prisons,” Bailão said. She added that while new provincial and federal funds are necessary simply to address the repair backlog, the construction of new affordable housing is a long-term necessity. Bailão and Pervis have sent a letter to Linda Jeffrey, the provincial minister of municipal affairs and housing, asking her to heed the City’s request. The City also hopes to influence other provincial and federal officials. Provincial and territorial housing ministers are set to meet in Toronto today.